Click on picture to order! This book starts off with a bang, specifically a plane crash. Despite Margaret’s fear of flying, her fiance coerces her into a flight in his Cessna before his certification test. An unexpected storm causes the plane to flip, trapping her inside as it explodes. The story reads like a memoir, such is the detail of her learning process about the extent of her injuries and medical procedures. The shocking revelations don’t end with her body and its new needs, as Margaret / Maggie spends more time with her family than she would have expected, or chosen. She discovers the true nature of her beloveds: suddenly absentee fiancee Chris, estranged sister Kitty, and distant mother—secrets bursting bubbles right and left. Some of those bubbles are burst by her recalcitrant physical therapist, whose already wobbly professionalism crashes at the charm of Maggie. 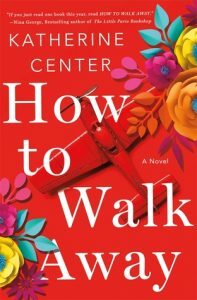 Center brilliantly leads the reader through a labyrinth of complex emotions and clashing dynamics on two continents to a hilarious and painful climactic scene, where Maggie cannot escape a situation more awkward than she could imagine. Then the story goes a bit over the top, ala Harlequin romance style, with the love interest taking a dangerous leap literally, and gushing about his feelings for her as though the rest of the world stopped for this moment. It’s difficult to see what is happening around them as they open up to each other in a completely inappropriate place and time. That life constantly takes Maggie by surprise is an endearing trait that makes her relateable and encourages readers to cheer her on through her physical and emotional struggles. There was a cringe-worthy scene early on where her professor tells her to “act like a man” for her interview, and she promises to do so. It’s very much her character, though, and Center maintains the integrity of all characters as they face secrets exposed and emotions unleashed. The denouement ends up being summarized, a bit of a disappointment in such a captivating tale, but leaves the reader with a sense of humanity restored as life exceeds Maggie’s expectations. This is a novel that reminds readers fiction often has much truth, in showing unspoken, understandable motives behind seemingly hurtful actions and how communication can resolve even long-held conflicts. I was fortunate to receive an ARC from St. Martin’s Press of this beautiful story by Katherine Center.